Demonstrating the passage of the sciatic nerve through the piriformis muscle is an anatomical abnormality which affects roughly 17% of the general population and may contribute to the development of piriformis syndrome. There are actually several varieties of sciatic nerve irregularities that relate to its position relative to the piriformis muscle. Some are more common than others, while certain varieties are especially problematic according to diagnostic statistics. However, there are some facts that are often left out of the picture of diagnosis based on structural atypicality. These facts show that piriformis muscle and sciatic nerve interactions might be innocent in many cases where an anatomical irregularity exists and might even lead to misdiagnosis of piriformis syndrome in many patients. This important essay provides foundation knowledge for any patient who demonstrates a sciatic nerve through the muscle abnormality, as well as any person who has been diagnosed with piriformis syndrome. Type A sciatic nerve is considered normal and is located beneath the piriformis muscle and fully outside of the muscular fibers. Type B describes an abnormality in which the majority of the sciatic nerve travels through the substance of the muscle, but the tibial branch of the nerve remains beneath the muscle of the muscle. Type C is similar to Type B, but in this case, the sciatic nerve remains beneath the muscle, while the tibial branch surrounds the muscle and resides in front of it, fully encircling the piriformis. Type D is one of the most often diagnosed in cases of piriformis syndrome and describes the entire sciatic nerve passing through the substance of the piriformis muscle. Type E describes the tibial portion of the sciatic nerve passing through the substance of the piriformis, while the remainder of the nerve passes in front of the muscle. 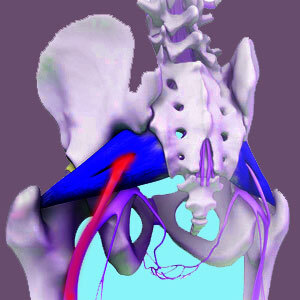 Type F describes the opposite of textbook normal, with the entire sciatic nerve passing in front of the piriformis muscle. Statistically speaking, anyone with any type of piriformis/sciatic nerve relationship, can be diagnosed with piriformis syndrome. Most people who are diagnosed demonstrate perfectly normal and typical Type A positional relationships between the 2 structures. However, there are a disproportionate number of people diagnosed who demonstrate certain particular variations of abnormality, with Type D being the most often seen clinically and Types B and E encompassing the remainder of most cases. Since MRI studies can usually detect the position of the sciatic nerve and can identify most abnormalities, attention often shifts to the piriformis during diagnostic evaluation, away from the hip and/or sacroiliac joint when an irregular nerve to muscle configuration is discovered. This is especially valid when no hip abnormalities are found, since MRI will also rarely identify sacroiliac joint problems. Therefore, in absence of other justifiable explanations, many patients with evidence of structural atypicality of the sciatic nerve in relation to the piriformis muscle will eventually be diagnosed with piriformis syndrome if they express pain that is consistent with the diagnosis. Reading the above section provides a traditional view of piriformis syndrome through the eyes of a Cartesian point of view. This ideology states that atypical structure is likely to produce pain. Unfortunately, there is no proof of the truth of this philosophy and overwhelming amounts of evidence that disprove the theory. In fact, a universal lesson taught in every medical school around the world states: “Atypical structure does not accurately predict pain”. This means that just because something looks different, does not make it inherently pathological or painful. Therefore, one can make the conclusion that atypical structural abnormalities between the piriformis muscle and sciatic nerve might act as scapegoats in just as many cases as where they offer logical explanations for symptomology. The rate of diagnosis of piriformis syndrome is higher in people with Type D, B and E irregularities, but is this because the atypical structure is the actual cause or is it just being implicated unfairly as such? This is the million dollar question. Unfortunately, there are no universal answers, since we see both scenarios in our clinical experience. The point of this final section is to cast doubt on the assumption that atypical structure will cause piriformis syndrome. In some cases, muscle and nerve positional irregularities might be causative or contributory, but this is not universally seen, with many people demonstrating all types of piriformis and sciatic nerve abnormality types, yet never developing symptoms.